From the comfort of one of the 64-chalet style rooms, Sarova Lion Hill Lodge offers a unique vantage point overlooking the Lake and the distant hills. Enjoy the panorama from the privacy of your own verandah. 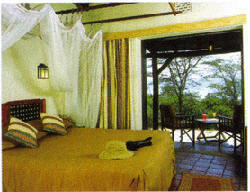 For extra special occasions Lion Hill also has one honeymoon suite and two luxury suites. For conferences with a difference, there are up-to-date facilities acoomodating upto 70 people. 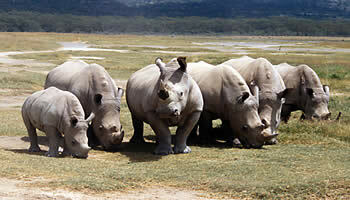 Other facilities include a restaurant, bar with a large viewing deck, overlooking Lake Nakuru and the distant hills, swimming pool, sauna, laundry service, curio and gift shop. - All bedrooms have verandas with panoramic views of the flamingo pink-rimmed lake. - Flamingo Restaurant serves meals on the ground floor; a patio is available at the pool. A buffet is served for lunch. Dinner table d'hote with a seating capacity of 200 people. 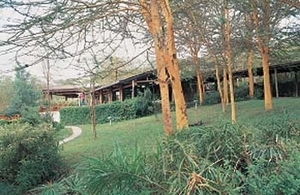 Rift Valley Bar on the ground floor overlooks the lake, and is open from 7.00 am. to 11.00 pm. - For conferences, Baraza Room on the ground floor is perfect; it is large airy room designed in earth colors and adjacent to a separate lounge. Audio-visual equipment and secretarial assistance is available. The capacity is 80 theatre, 150 cocktail and 40 seminar style. - Swimming pool and sauna are open from 6:00 am. to 6:00 pm. - Traditional dancers display their talent everyday at 9.00 pm. - hot and dry during the day, cold at night.